The EZ Series grader is our most affordable grader. 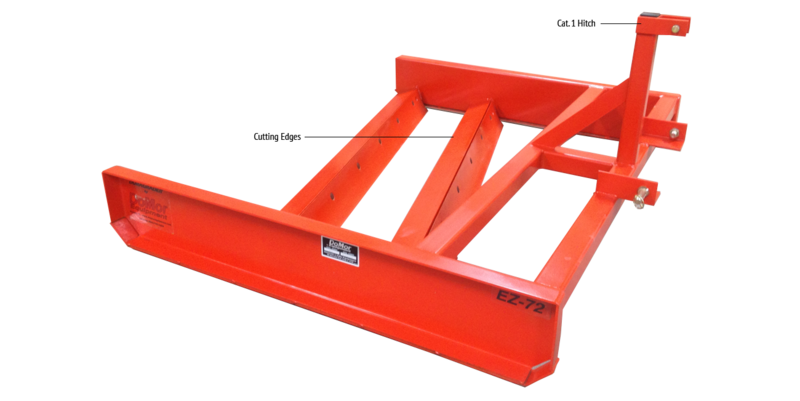 It’s slightly lighter design allows it to be used with compact and utility tractors as well as full size tractors and is designed to work on all category 1 three-point hitches. The EZ Series Dura-Grader is designed to work with minimal 3 pt. lift control and allows anybody to achieve professional grading results. The angled blades give you the ability to return material back to the road from the shoulder and crown roads quickly. 3” rugged tube steel design: The rugged ¼” thick tube steel design will give you years of dependable service and requires almost no maintenance. High carbon cutting edge: Every Dura-Grader is equipped with the same cutting edges that are found on commercial motor graders. Brings your existing material back to the surface without the need to buy more rock. Quick hitch compatible: Comes with two pre-drilled holes for the top link pin, giving you the versatility of hitching to any category 1 tractor with a quick hitch. EZ-60 485 lbs. 25 HP. 65 in. 32 in 48 in. 5ft. EZ-72 520 lbs 30 HP. 77 in. 32 in. 48 in. 6ft. EZ-84 565 lbs. 35 HP. 89 in. 32 in. 48 in. 7ft.